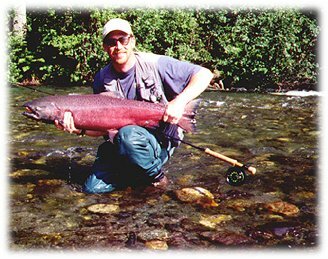 Alaska's Matsu Valley provides excellent king salmon fly fishing on many Parks Highway streams. King salmon fishing is very popular with Alaskans and visitors. Bushwhacking For Kings In Fly Fishing Heaven! There may be no greater freshwater thrill than to watch the king of all salmon crash flies in a foot of water, then go berserk, melting flyline off stout reels as they head toward far reaches. They can take the angler anywhere they want and the hope is to follow and wish, all the while looking ahead for a decent place to land the big fish once he tires. Small streams are often quite clear and provide the fly caster the opportunity to effectively stalk and sight fish his quarry. All the while the adrenalin is building as each pass of the fly past the target tenses muscles and readies reflexes in anticipation of that initial jolt and the ensuing hook set.